“I went to Moscow and all I got was this Gosha Rubchinskiy T-shirt,” was the headline I mentally shelved for this article — a phrase that since returning from the Russian capital I realise couldn’t have been further from the truth. I was invited to Moscow to attend Mercedes-Benz Fashion Week Russia that has been held here since the country first embraced capitalism. 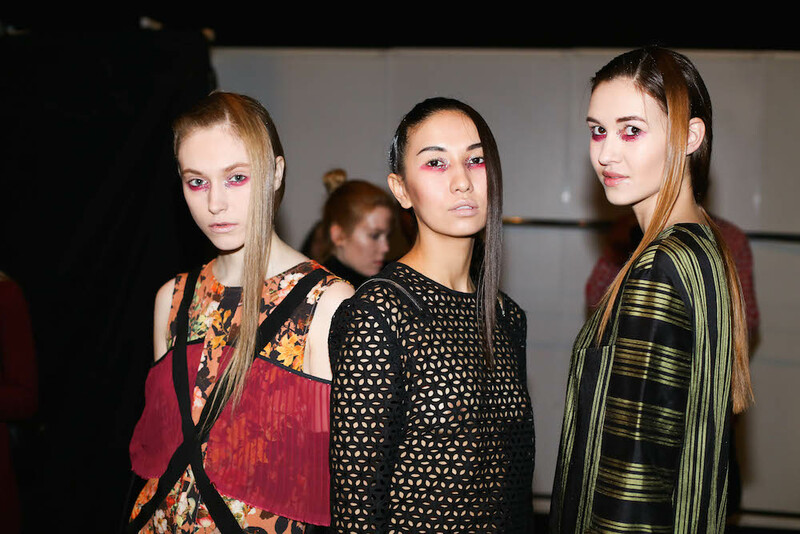 In its infancy MBFWRussia showcased Russian designers alongside the likes of Vivienne Westwood, Jeremy Scott, Julien Macdonald and Matthew Williamson among others. Now in its 32nd season, MBFWRussia is centred on local talent, as well as that of many post-Soviet countries such as Ukraine, Georgia, Belarus and Kazakhstan. Over the years MBFWRussia has remained loyal to the designers that have participated since the beginning. This season MBFWRussia brought together industry professionals from across the world for the Fashion Futurum, a two-day conference concerned with everything from digital platforms to new technologies. Going to a fashion week, especially one where you’re picked up from the airport in a car emblazoned with the words “Fashion Force”, does not guarantee you a true glimpse of that city. But my baptism of fire into the fashion world did give me a perspective of Moscow that was rich and varied. A city with traditional values that’s looking toward the future — something that cannot be summed by a slogan tee. 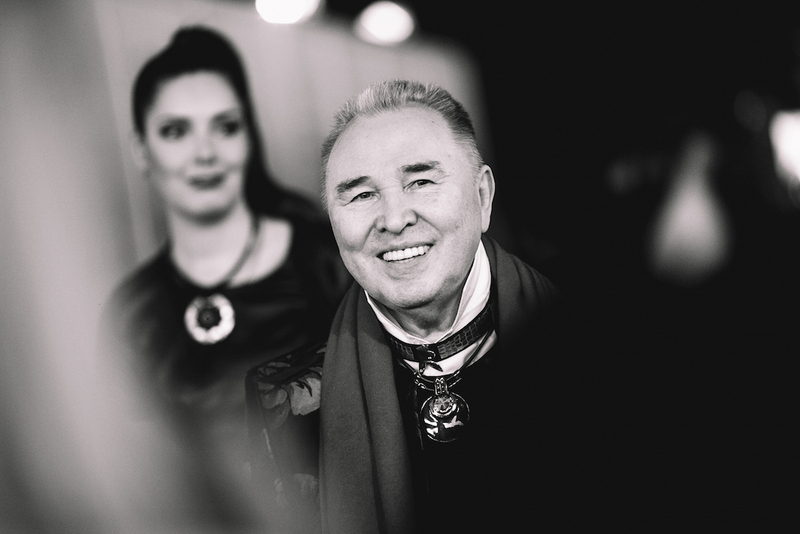 One of the biggest mistakes you could make during Moscow’s MBFWRussia, besides forgetting your business card as a journalist, is not standing up at the end of a Slava Zaitsev show — something I quickly learned when a tap on the shoulder and a menacing look urged me up from my seat before I had the chance to applaud. Nicknamed the “Red Dior” by Western media, the 78-year-old is a long-standing headliner of this fashion gig and the only designer to receive a standing ovation from audience. 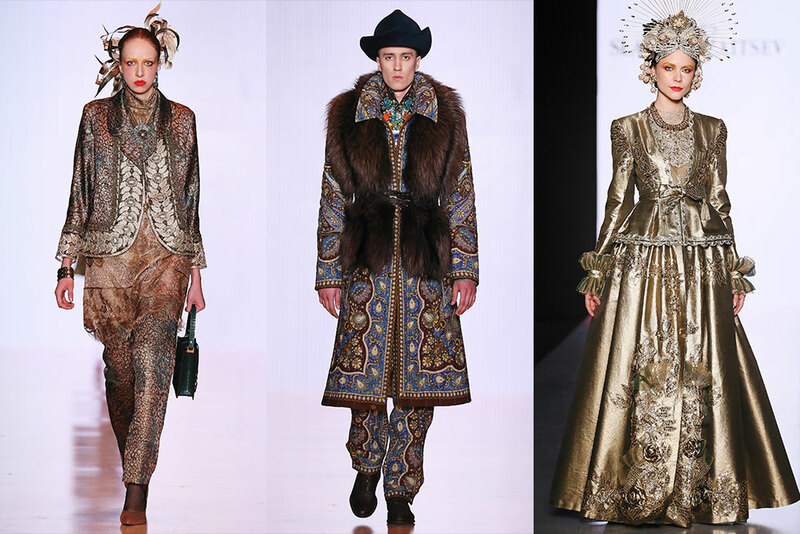 With his whimsical outfits straight out of a Russian fairy-tale, it’s impressive for one designer to have survived the grey days of Communism — as the only couture designer, no less — and the post-Soviet market with its influx of western designers, and still emerge a celebrated craftsman. Each season Zaitsev opens MBFWRussia with a collective show of students from his Fashion Laboratory. 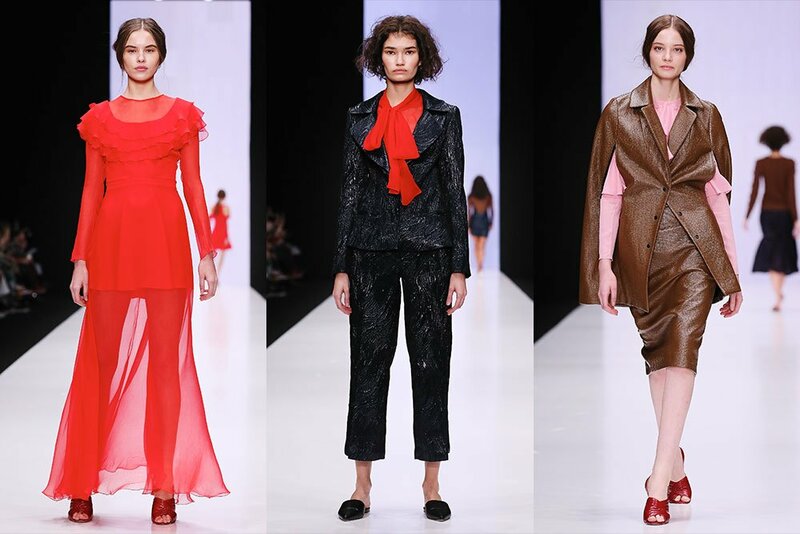 “For the new generation of fashion designers it is very important to be on stage with such mentor as Zaitsev,” the founder of MBFWRussia, Alexander Shumsky told me in an email. Yet, with decades of stardom behind him it’s difficult to know what people really think. 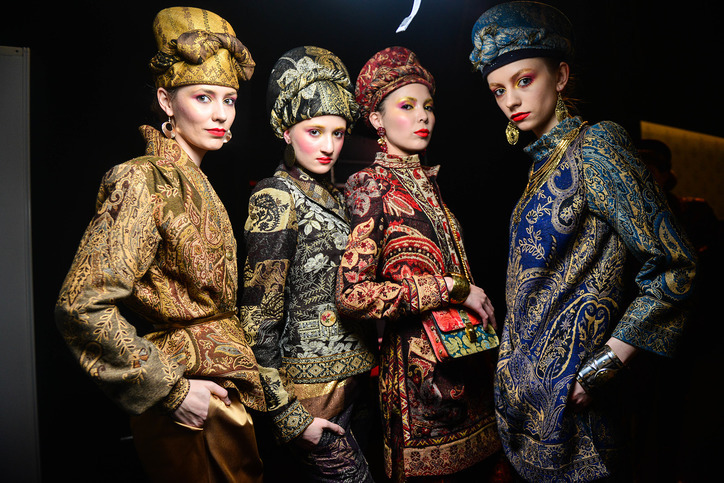 “Slava is Slava,” I heard many times after the show, which makes you wonder whether the sycophantic reception for his glitzy new collection — aptly named the Golden Era for its dazzling embroidery — was all part of the performance. Whether it’s “Army of Russia” slogan hoodies or top-to-bottom folklore, as past MBFWRussia have shown, it’s easy to get carried away with the topic of nationality. 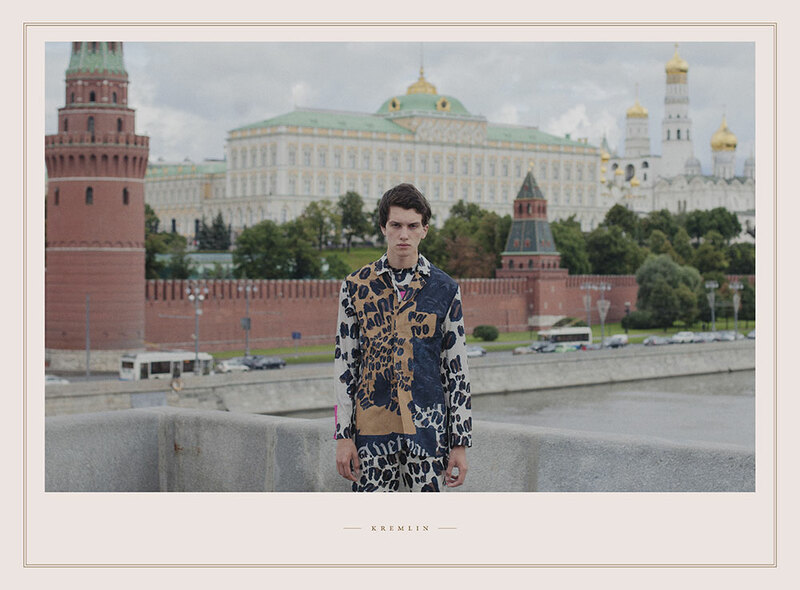 Despite the increasing demand for local wares, there were no “Made in Russia” or Cyrillic slogans emblazoned on t-shirts or jackets, and Soviet symbols were scarce, except for one children’s collection by St Petersburg-based designer Lera Gvin. 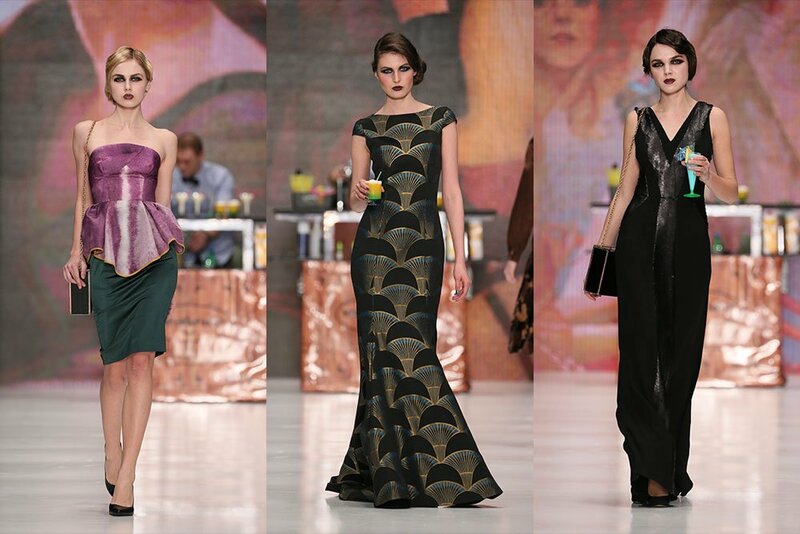 While Russia was there in the background of MBFWRussia’s leading fashion pack, it was not as apparent as in Zaitsev. Translating the periodic table onto dresses and pajama suits, Dasha Gauser’s prints were a subtle nod to Russia and its famous chemist Mendeleev. Backstage at Viva Vox, Oleg Ovsiyov cited the classic Soviet film A Slave of Love by director Nikita Mikhalkov as his starting point, yet the collection was influenced as much by the cocoon silhouettes of late Italian designer Romeo Gigli, and the decade we all hate to love, the 1990s. 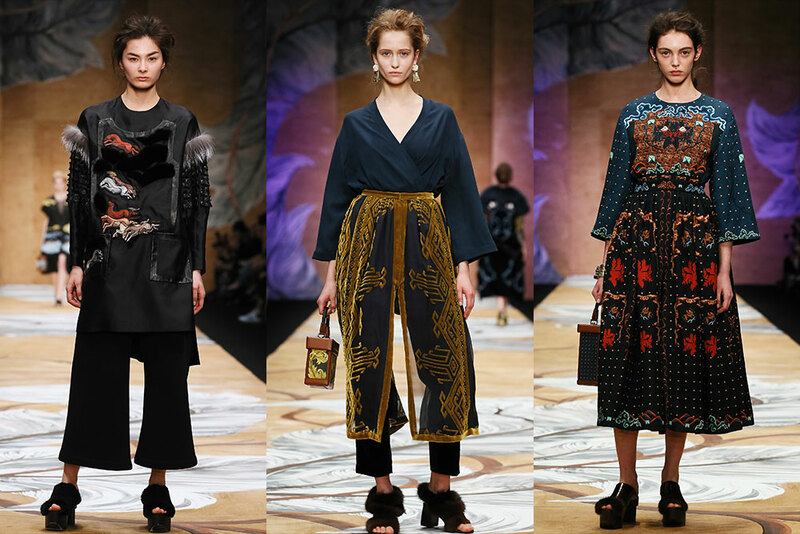 Alena Akhmadulina, on the other hand, turned to Mongolia and Tibet for her folklore motifs. But for many emerging designers, the worlds created for the runway were far removed from reality. 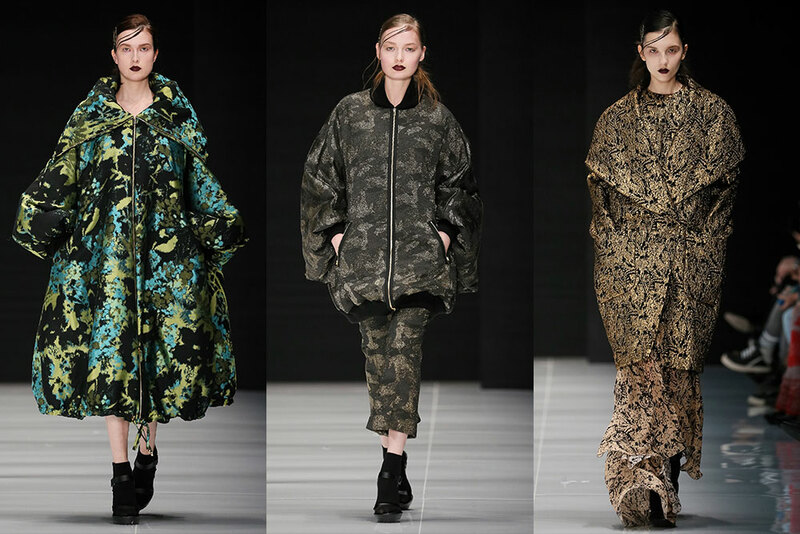 One example is Yury Pitenin who founded the Saint-Tokyo label in 2012, and who based his A/W 15 collection on the atmosphere of war in Russia. This season Saint-Tokyo opened with the Bladerunner soundtrack. Pitenin attempted to reconstruct the human body by creating cut-outs or attatching fabrics that protrude from the body. Elena Zemtsova, who showed her collection as part of the ContraFashion collective, did something similar with leather trousers, and covered the models' faces in black masks, adding decoration in the form of flashy needle-like spikes. “Sometimes going back [in history] can be a step forward,” announced Sara Maino, Head of Vogue Talents, listing “a link to one’s heritage” as one of the traits she looks for in emerging designers. Is this generation trying to escape the pull of post-Soviet aesthetics, or is this dystopian style reflective of something going on now? With vodka being cheaper than Evian in Moscow, there’s more incentive to be bad than good, and this season was largely dedicated to the former. Ksenia Knyazeva’s American prohibition-era themed show featured a speakeasy bar with drinks created by famous Moscow barman Evgeniy Asotskiy. Models helped themselves to cocktails walking onto the runway, building tension as the audience awaited the inevitable spill. Knyazeva toughened up drop-waist dresses with Japanese bombers. Her revealed her muse to be Gertrude “Cleo” Lythgoe, “a bootlegger, a criminal woman who inspired me with her bad behaviour. She has very beautiful, very tough and very unique.” After a (staged?) spilled drink, the show ended with the sound of police sirens. Other designers devoted their collections to talented but controversial female figures. 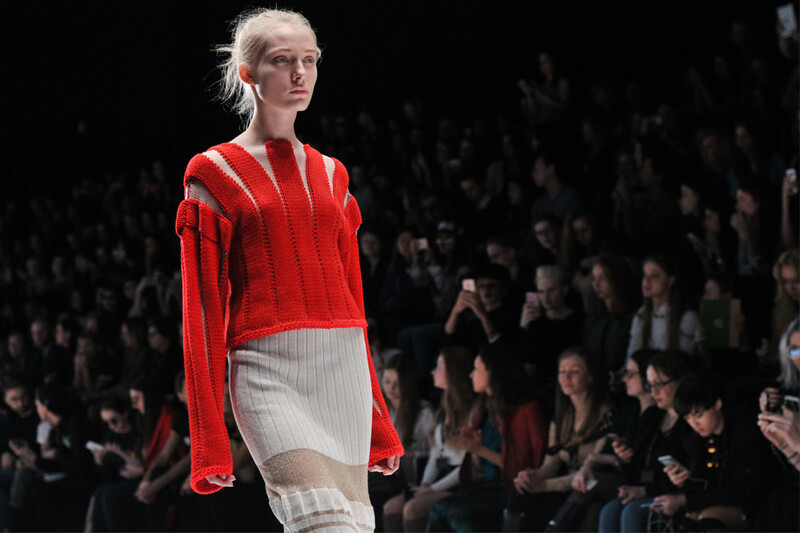 For newcomer and label-to-watch KseniyaSeraya it was German avant-garde dancer Pina Bausch. 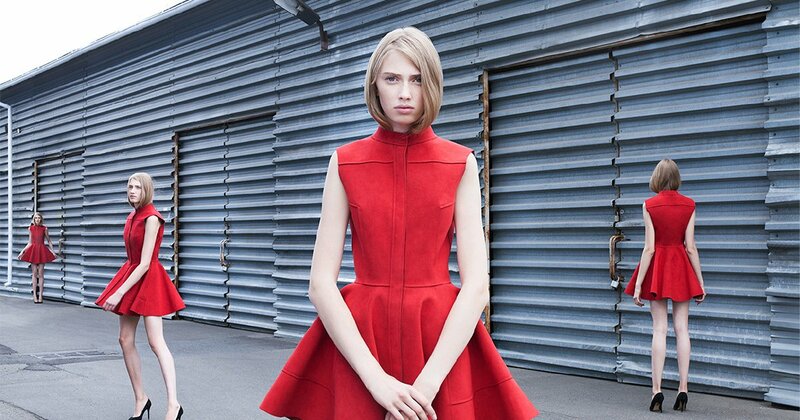 “In 1988, designer Yohji Yamamoto made her a red dress. Though she is no longer alive, I wanted to make a red dress especially for her.” Constructed entirely out of machine-programmed slouchy knitwear, Seraya combined classic woollen yarn with thin synthetics to create a dress that would change form with movement. Ukrainian-born Yasia Minochkina, on the other hand, offered a wardrobe that combined the best of two brilliant women — actress Marlene Dietrich and artist Frida Kahlo. Georgian designer Goga Nikabadze introduced oversized shirts, floor-length gilets, heavy robes in gender-neutral bold and pastel tones that were indistinguishable for men and women. This was as far as MBFWRussia got in terms of gender-bending — something designers elsewhere in the world are embracing more and more. For Nikabadze, androgynous outerwear went hand-in-hand with the relaxed nature of the rest of his garments. Beneath, the entirety of womenswear consisted of skirts or dresses, though I expected to see some of the loose-fit chinos make the transition from his menswear line. Young brand Sorry, I’m Not also found a perfect solution for long journeys to the supermarket, now that many of the metro kiosks are closing down in Moscow. Founded by Nikita Moiseenko, Sorry, I’m Not's collection was centred around a “jellyfish-girl that sets mens’ hearts racing”, as Moiseenko described. For the designer, the underwater universe was the perfect setting for revealing the trolley-bag, typically only seen around food markets in Russia. 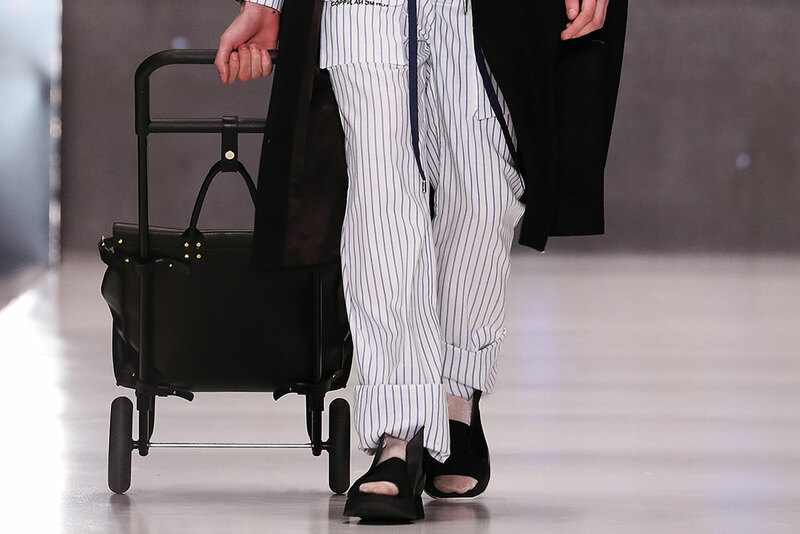 As with the navel-baring burka the show opened with, the trolley-bag is another attempt at provocation by Moiseenko — though judging by the reactions of the international press, it looks like it’s set to be this season’s new it-bag. 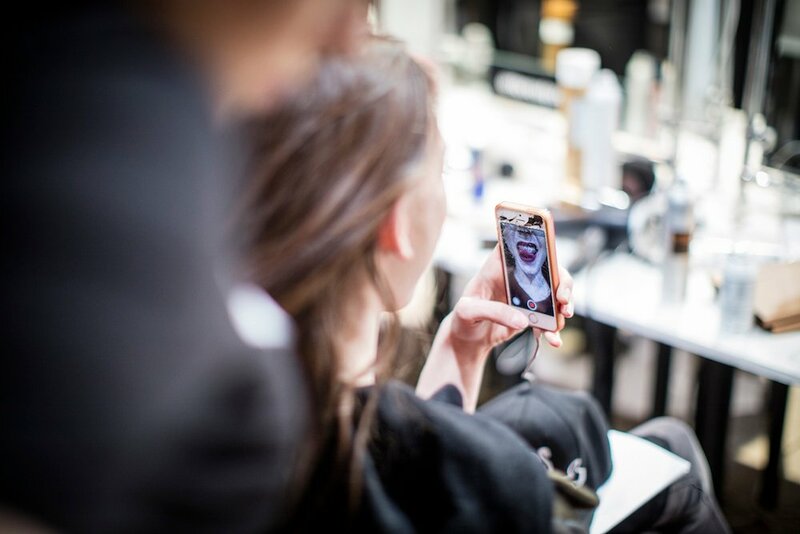 Along with seating squabbles, selfies are customary to MBFW. When models aren’t posing for photographers, they’re preoccupied with choosing the right filter and hashtag, or trying to squeeze in together for that Oscar group-shot. Things aren’t that different on the front row. 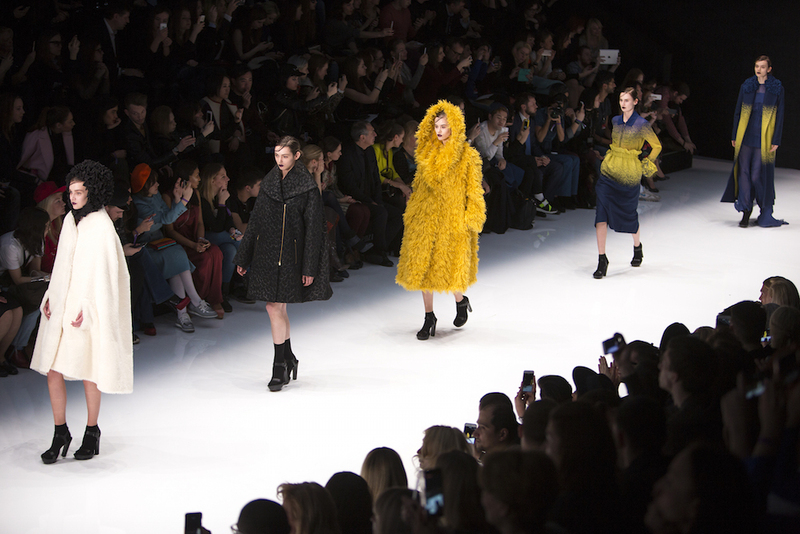 In fact, Russia differentiates itself from other fashion weeks by making it totally acceptable to take selfies throughout the show — why waste the opportunity when you have runway spotlights? Though it makes sense to attribute exaggerated selfies to fashion week, these were not exclusive to Manege, where MBFWRussia took place. Walking past Red Square each day I saw many Russian-speaking tourists contorting their bodies in rehearsed poses. The only difference were the outfits. Besides Instagram, many of the younger generation were using Periscope to live-stream shows to their friends and followers. The app allows you to read and respond to comments as you stream, meaning you don’t have to take your eyes off your phone. With most of the audience watching the shows through their screens it’s not a surprise that virtual reality has been such a hit at MBFWRussia. Last year MBFWRussia collaborated with Youvisit to create Mirror to the Soul, an award-winning film that allows viewers an exclusive 360-degree experience of the event without ever having to step into Manege. 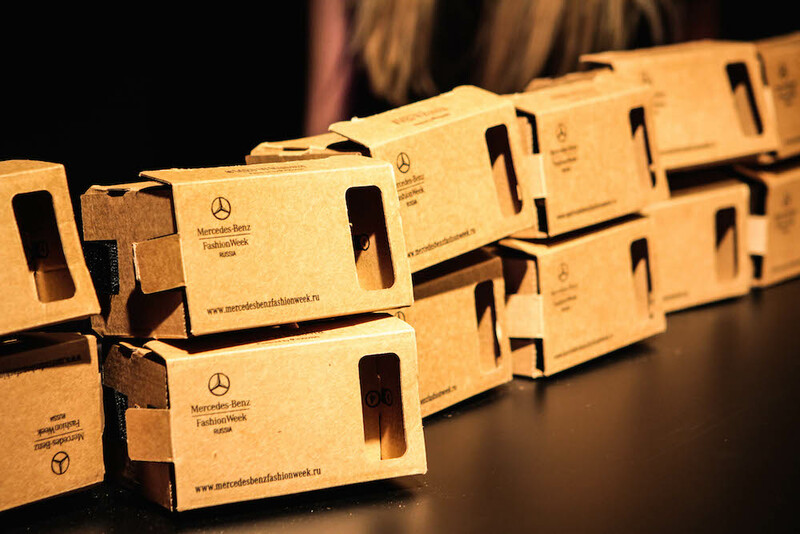 This season, MBFWRussia offered a Virtual Reality masterclass run with the help of former blogger and New York Times photographer, Craig Arend. 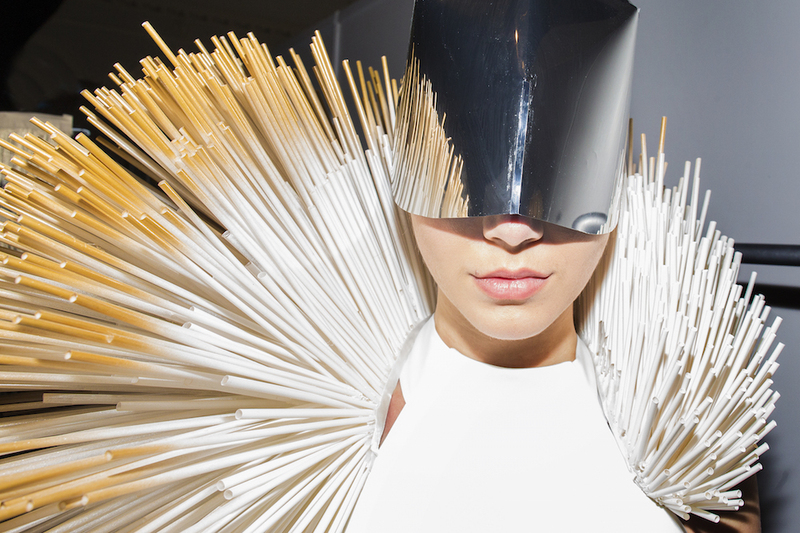 Fashion forward: can Kazakhstan become a designer capital of the future?